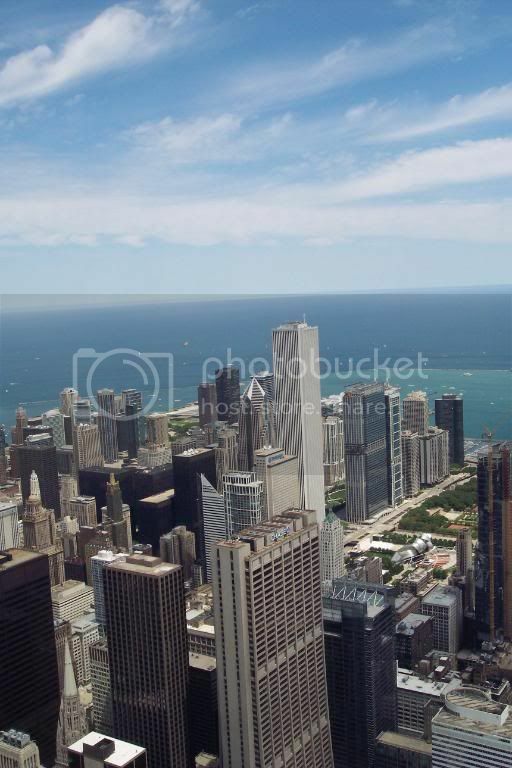 I really meant to blog every night, but last night, after a full day on the exhibit floor, a trip up the Sears Tower, and then the Newbery/Caldecott/Wilder Banquet, all I could do last night was climb the stairs to our room, take off my pointy shoes (how do some of you wear those every day? ), and fall into bed after an amazing, amazing day. It started with a moment I’ve been waiting for 28 years. 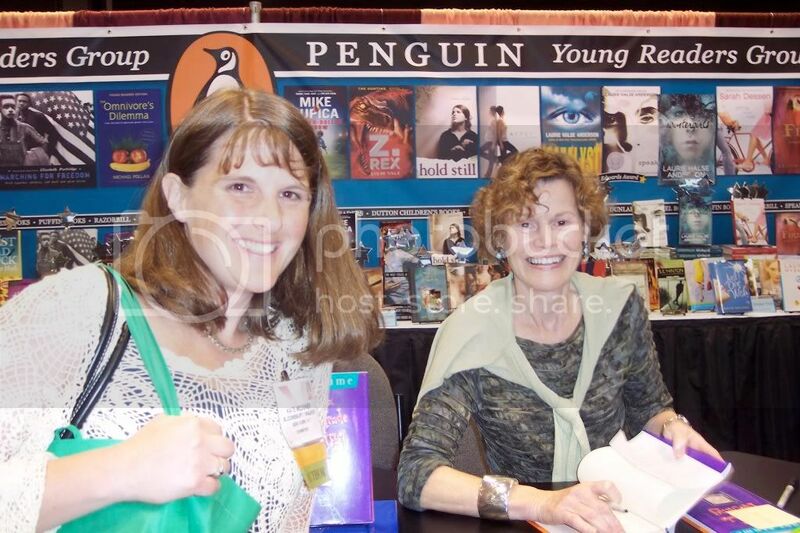 I met Judy Blume. JUDY BLUME!!!!!! Her signing was right before mine, so my daughter and I were the first ones in line. She and Beverly Cleary were my first favorite authors, and I remember reading FUDGE and ARE YOU THERE GOD, IT’S ME MARGARET in the beanbag chair in my closet wondering what Judy Blume must be like. She is beautiful and delightful and kind, and I just about cried when I met her. Her books made me want to be an author, so having the opportunity to tell her so and say thank you was something I will never forget. 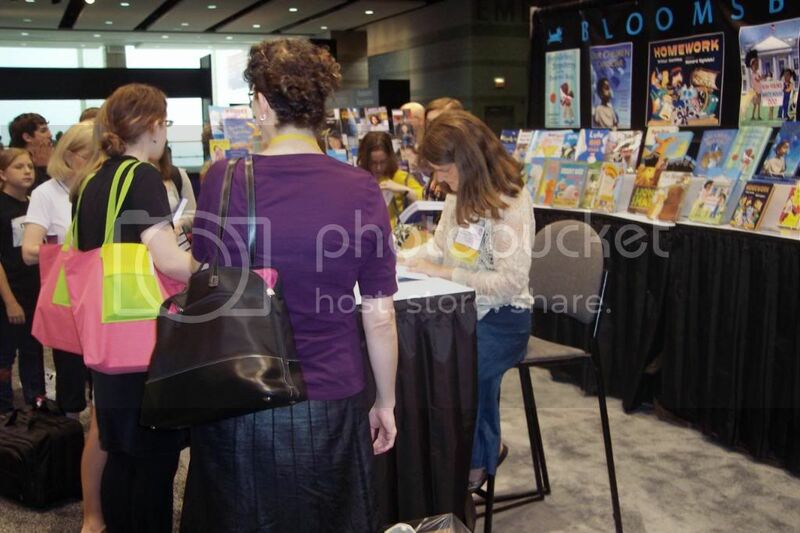 Then it was time for me to sign advance copies of THE BRILLIANT FALL OF GIANNA Z at the Walker/Bloomsbury Booth. My husband and kids acted as loyal members of the paparazzi and took lots of photographs. Here’s the whole Bloomsbury/Walker crew! made me feel so much more relaxed. 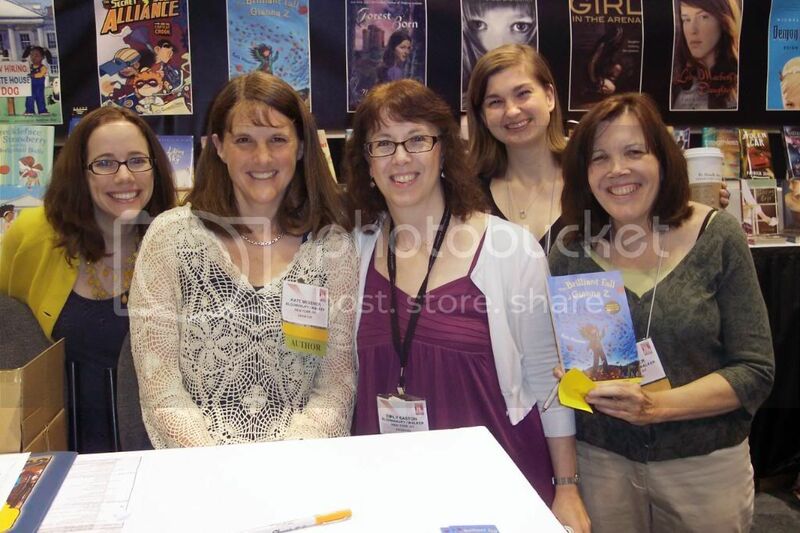 After my signing, we walked the exhibit floor for a while. Everywhere I looked, there were people whose work I’ve admired for years. After we mailed a box of books home (they have a Post Office right there in the exhibits hall! ), we headed out for some sightseeing. The Sears Tower has a new attraction — the Airwalk, where you can step out onto a glass platform that hangs out over the edge of the skyscraper. 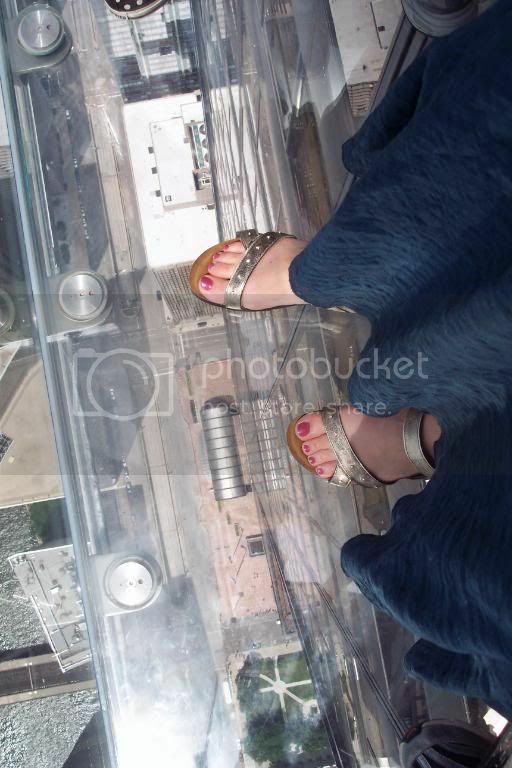 The bottom is glass, too, so it feels like you’re just hovering there, 103 stories up. By late afternoon, it was time to head to the Book Cart Drill Team Championships, which were as entertaining as Betsy Bird promised me they’d be. Here’s the team from Des Moines in action. 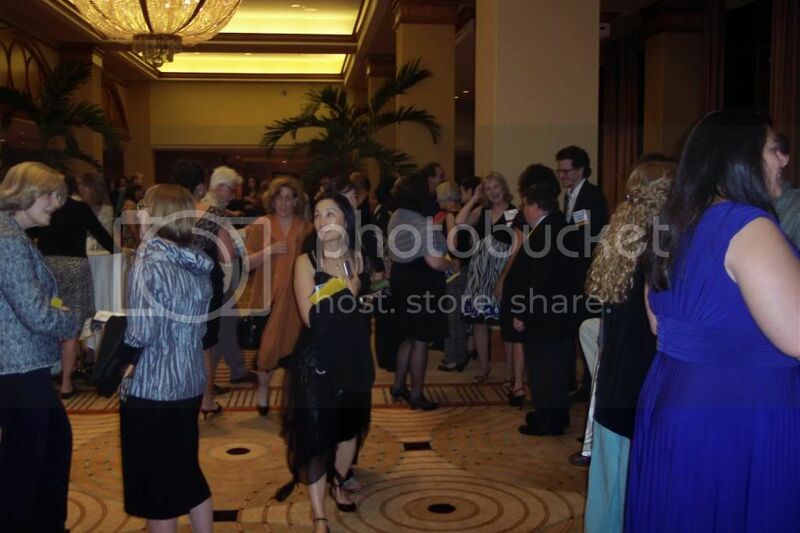 Then it was off to the Newbery/Caldecott/Wilder Banquet, which was held downtown at the Sheraton, too far from the convention center to walk. Due to a bizarre series of events which included some poor planning on my part and hour-long waits for shuttle buses, I ended up paying $10 for a ride to the banquet in this. The driver (I’m convinced he was sent by the literary gods to keep me from missing my first ALA banquet) appeared in the convention center lobby offering rides to those of us stranded at the back of the cab line, so ten of us made quick friends with one another and piled into the limo. At the hotel, I found Betsy Bird (Fuse #8) who had offered to let me join her table when we met at my writers’ retreat a few weeks ago. How fabulous is her outfit?! 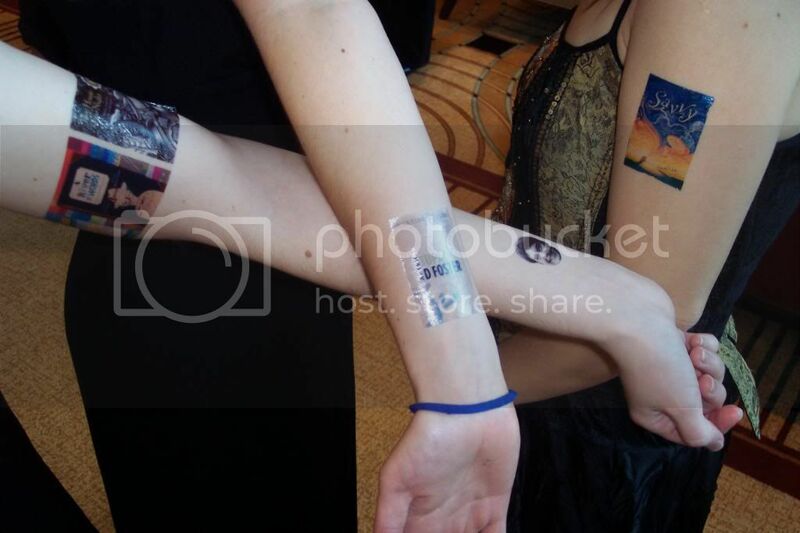 She shared some of her literary tattoos. 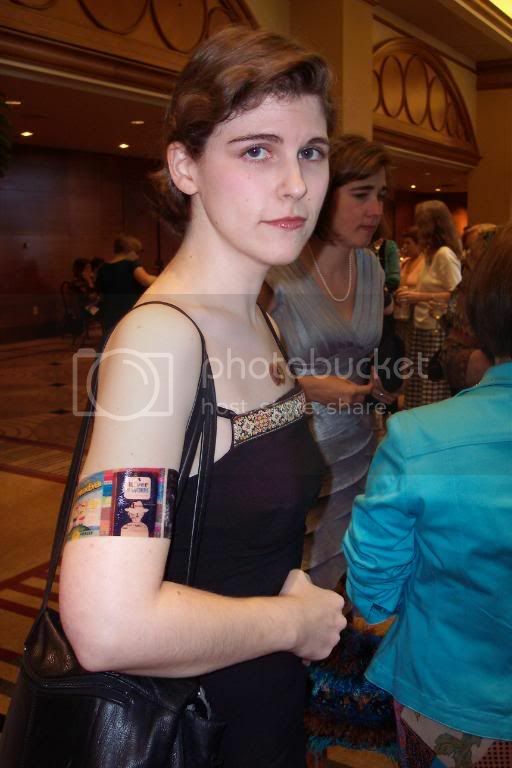 I ended up with Marla Frazee’s A COUPLE OF BOYS HAVE THE BEST WEEK EVER on my left arm. The banquet itself was unforgettable. The winners’ speeches moved and inspired me. I’d try to recap, but I know I wouldn’t do them justice, so you should probably just listen when they’re shared online. also did a great writeup of Neil Gaiman’s speech on her blog. After the banquet, you could stand in a receiving line to congratulate everyone. At one point, someone ducked in front of Betsy to talk to Neil Gaiman, and I thought, "Hey! That guy’s cutting the line!" …until I saw that it was Sherman Alexie. Sherman Alexie can cut in front of me any day. Today, we’re headed back to the exhibit hall for the morning. Then I’m meeting a friend for lunch & aiming for a two-museum afternoon before we head home tomorrow. This entry was posted in Uncategorized and tagged ala. Bookmark the permalink. Both comments and trackbacks are currently closed.